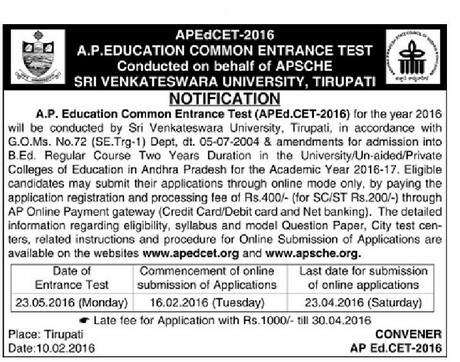 APEdcet 2016 notification has released by the APEdcet 2016 convener on 10.02.2016 on behalf of APSCHE.APEdcet 2016 conducted by the Sri Venkateshwara University,Thirupati for admission into 2 Years B.Ed regular course in the University/Un-Aided/Private Colleges of education in Andhra Pradesh for the academic year 2016-17.
marks either in the Bachelors Degree i.e. 40% marks in the qualifying examination. Should be of Indian Nationality. to all other reserved categories should have secured 40% marks in the qualifying examination and secured rank at APEd CET 2016 and satisfy other conditions laid therein. Eligible Candidates may submit their applications through online mode only. Application registration and processing fee of Rs.400/(for SC ST Fees 200/-) through AP Online Payment gateway(Credit card/ Debit card).